The antibody detects endogenous level of total 4E-BP1 protein. Antibodies were produced by immunizing rabbits with synthetic peptide and KLH conjugates. Antibodies were purified by affinity-chromatography using epitope-specific peptide. Supplied at 1.0mg/mL in phosphate buffered saline (without Mg2+ and Ca2+), pH 7.4, 150mM NaCl, 0.02% sodium azide and 50% glycerol. Peptide sequence around aa.43~47 (S-T-T-P-G) derived from Human 4E-BP1. Store at -20 degree C for long term preservation (recommended). Store at 4 degree C for short term use. Small volumes of anti-4E-BP1 antibody vial(s) may occasionally become entrapped in the seal of the product vial during shipment and storage. If necessary, briefly centrifuge the vial on a tabletop centrifuge to dislodge any liquid in the container`s cap. Certain products may require to ship with dry ice and additional dry ice fee may apply. 4E-BP1 encodes one member of a family of translation repressor proteins. The protein directly interacts with eukaryotic translation initiation factor 4E (eIF4E), which is a limiting component of the multisubunit complex that recruits 40S ribosomal subunits to the 5' end of mRNAs. Interaction of this protein with eIF4E inhibits complex assembly and represses translation. This protein is phosphorylated in response to various signals including UV irradiation and insulin signaling, resulting in its dissociation from eIF4E and activation of mRNA translation. 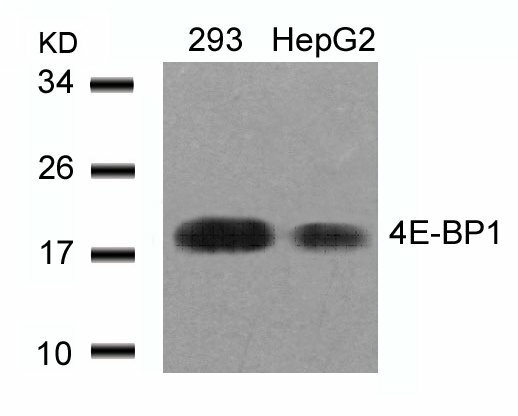 Western blot analysis of extracts from 293 and HepG2 cells using 4E-BP1(Ab-45) Antibody. 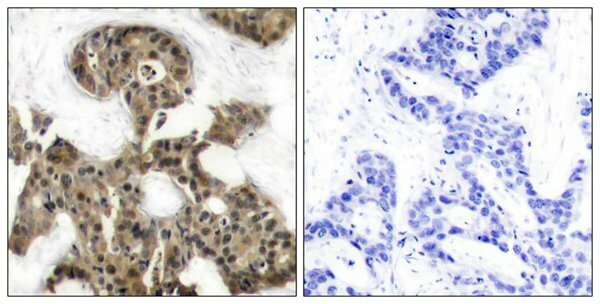 Immunohistochemical analysis of paraffin-embedded human breast carcinoma tissue using 4E-BP1(Ab-45) Antibody (left) or the same antibody preincubated with blocking peptide(right). 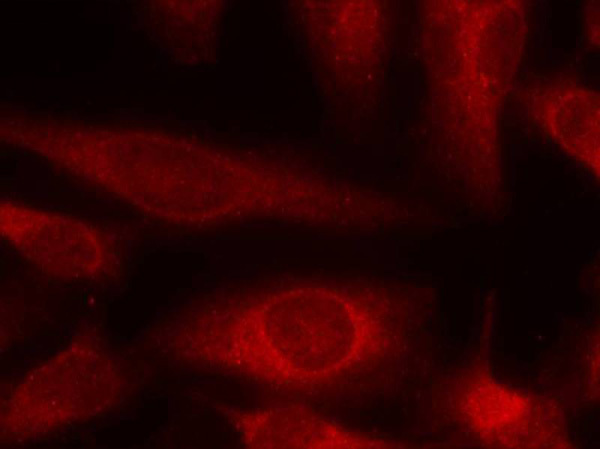 Immunofluorescence staining of methanol-fixed Hela cells using 4E-BP1(Ab-45) Antibody. NCBI/Uniprot data below describe general gene information for 4E-BP1. It may not necessarily be applicable to this product. 4E-BP1: binds to eIF4E, preventing its assembly into the EIF4F complex and inhibiting cap-dependent translation. Phosphorylation of 4E-BP1 disrupts this binding, activating cap-dependent translation. Mediates the regulation of protein translation by hormones, growth factors and other stimuli that signal through the PI3 kinase pathway.